Pokémon Pikachu is a self-contained video game. It is part of the Pokémon series. An interactive Pokémon-themed pedometer, in which players can play with Pikachu and check its friendship. The player can also check the time, give watts to Pikachu as a gift, and play on a slot machine. 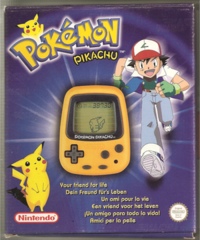 This game was followed by Pokémon Pikachu 2 GS, which is based on the second generation of Pokémon games. This page was last edited on 23 March 2019, at 15:56.